The big square box in the photo above is the Kroger on Parsons Avenue, with a large parking lot in front. It’s never full, even when the first week of the month rolls around. Now, look at the two yellow [school buses] parked in the lot just north of the Kroger store. That area is also part of Kroger’s parking lot. A “land mass” equivalent to six single-family home sites, sits vacant, with the exception, as one can see here, of four parked cars. The “empty lots” contribute $2,027 in property taxes. Perhaps a reasonable amount, considering they are producing nothing. But that’s just it. Those lots are doing nothing. 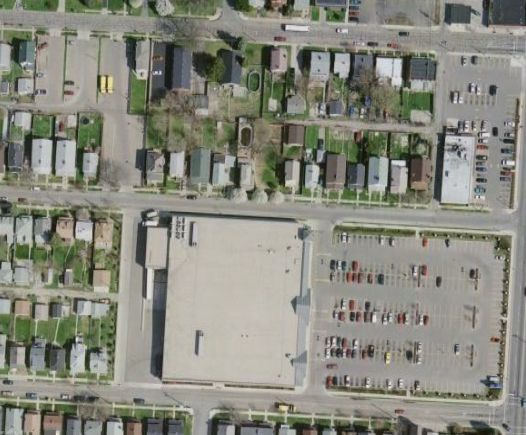 Likely part of a parking-to-retail ratio when the Kroger store was built (1998), these empty lots create urban blight. A collection point for litter and ad-hoc car repair, this is another example of poor land use. Even with a modest level of property taxes, six new homes on this “should-be” in-fill site, would generate $104,000+ in taxes and create an opportunity to provide new housing, as well as bolster the adjoining properties value. With a land value of over $100,000, I can’t imagine why Kroger hasn’t filed for rezoning so that they could be sold off. Worse still, is why the City hasn’t offered to rezone the lots for the sake of creating more revenue for itself. Like with any other issue that has arrived over the past 20 years, I immediately plunk myself down when I find that Architecture Minnesota has arrived in the mailbox. The official magazine of AIA Minnesota, it’s been a nearly life-long companion in every place that I’ve lived. Having Minneapolis delivered to my home every-other month keeps me connected. Filled with great design and projects by Minnesota architects, one will also find interesting tid-bits about how the Twin Cities (and other Minnesota towns) are dealing with growth, density, transit, energy use and a myriad of topics that are also very relevant to what’s happening in Columbus. While reading the most recent issue, I discovered an article by Sarah Harris, a former schoolmate, who is the executive director of “Walking Minneapolis”, a private foundation seeking to create a more vibrant and pedestrian friendly downtown. Walking Minneapolis is a private-sector project to ensure the city becomes “world class” for the pedestrian. Celebrating the urban environment through connecting pedestrians to historical, cultural amenities, with an eye towards the element of discovery and social and physical health, Walking Minneapolis, as a private entity, is not subject to short-term public funding or public leadership cycles. It’s a stunning example of what Columbus could do as well, considering that our downtown has crossed the threshold to something new and vibrant. Click here to download thier summary. A last minute decision to get out of town for the weekend, and I burned through a whole lot of frequent flyer miles to get this ticket. It’s been over a year since I’ve parked at Port Columbus and I’ve noticed while picking up visitors that there have been some changes out there. I popped onto the web site to get the skinny on parking and I found this. “Bicycle parking, is now provided free of charge for all passengers and guests”. Thoughts of 670, 270, Stelzer Road, Cassady and Fifth Avenue run through my mind. I don’t think there’s a bike lane on any of these roads, making the lure of “free parking” at the airport not all that attractive. Even the photograph marketing this is a bit…how shall I say…lame less than convincing. 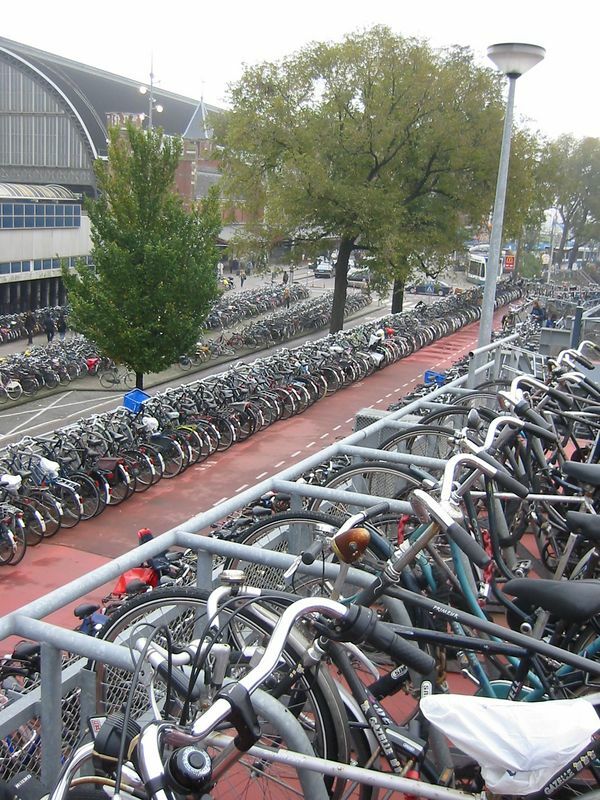 Compare Port Columbus’ promotional picture to the bicycle parking at Amsterdam’s Central Station here. Part I: Just How Far? So, I’ve been invited to Ontario for Canadian Thanksgiving. The benefit of celebrating Thanksgiving in October is that only one other guy at work may be asking for that weekend off, but I’m quite sure that he won’t be going north for the holidays. The tough part is getting there. The farm is two hours east of Toronto. By car, it’s 10 hours (without stopping) and four tanks of gas. While airfare to Toronto last year was in the $200 range, this year, it’s almost double that. Taking the train, something I’ve never done in the US, would require a drive to Cleveland for a 01:00 departure and a five hour stop-over in Buffalo, for a total one-way travel time of 19 hours. Add on the two-hour drive from Toronto. Round-trip cost of $130. Surprisingly, Greyhound has the best schedules, and I can get within 40 miles of the farm by taking it to Peterborough. For $90 round-trip, I can leave Columbus on an all-nighter, stop in Cleveland, change buses in Buffalo (one hour stop-over) and again in Toronto, and be in Peterborough in 13 hours. It’s a bit shocking to realize that a bus is more efficient than a train. I’ve zoomed from Frankfurt to Berlin at 250 km/hour. Brighton to London in two hours. Trains from Helsinki depart to Lapland several times per day, and from Germany to The Netherlands with only one stop. I might even consider the train to Toronto if I didn’t have to spend two hours driving to it. Friends are warning me about the bus ride, telling me that “the bathrooms stink” and that according to a reporter for This American Life, “few people on the bus were willing to talk”. BINGO! Sold. On an all-night bus, it would be my hope that no one would be willing to talk. More to come as the journey unfolds. If you’re looking for a unique gift, or simply a stunning accent piece for your home, consider the works of Devon Palmer. Originally from Indiana, with a former career in aviation, Devon’s passion now lies in woodturning at his Columbus studio in the Short North. Collections of plates, platters, vases and spindle work demonstrate his talent and are available for purchase by contacting Devon directly. For more information, visit his website. Everything I’d ever heard my mother say came rushing back. An unintentional tribute to being raised as a germ-free Catholic. Athletes’ foot. Psoriasis. Urinary tract infection. An attack by a Candiru. Strep throat. Ear infection. Had there been anti-bacterial cleaning products at the time, our house would have been shrouded in the amber glow. The air-conditioner couldn’t keep up and by the fourth day of 100-degree temperatures, I needed relief. I considered one of the city’s hotels, but with the price tag of nearly $100 I had to find Plan B. I needed water. A swimming pool. I’d seen it while out bicycling; The City pool near my house, one of ten that my tax dollars support. Growing up, the cool blue waters of the pool at Longfellow Park played host to the neighborhood families during the sweltering days of Minneapolis’ summer. My sister and I were prohibited from joining in and were relinquished to the shallow blow-up pool that could only remain in any given spot for a few hours, an afternoon at the most, for fear of ruining the grass. Never mind the days without rain, the grass must be protected. As an adult, I really couldn’t pull off splashing around by myself in a blow-up pool. My image had to be protected more than the grass. It was already like straw. I’d always suspected my mother’s anxiety over public pools was misguided, so I slipped into my flip-flops, crushed a towel into a plastic grocery bag and headed over, checking, just in case, that my insurance card was still where I’d left it. The fifty-cent admission had been waived due to the excessive heat, and kids of all ages jumped and dove. The adults, the few that there were, gathered in the center or sat at the edge, feet in the water. Loud, excessively LOUD music blasted from a speaker incapable of handling the bass, but the water was now within inches and nothing else mattered. Except for one. While I carry a Scandinavian surname, I also carry a sweater of abdominal hair from the eastern-European Lacoste collection given to me by my maternal genome. I always hesitate, just for a moment, before removing my shirt. A baptism of relief as my body and mind cooled. A few backstrokes through the water and within seconds, I felt renewed. The anguish of oppressive heat vanished. Lifeguards kept watch and reeled in the occasional unruly child. Every thirty minutes, or so, a whistle blew and the kids leapt out, leaving the waters more calm for the adults. I realized that this facility was playing a vital role, as kids and adults, alike, took refuge from the heat. Social and cultural difference leveled, we were all there for the same reason; relief. I wondered of the social consequences if it weren’t available. Social unrest increases as the temperature rises, and this pool, like the nine others throughout the city must certainly keep the spikes off of the statistical charts.